Congratulations to "Tammy Y. ", the winner in Janie's giveaway. Thank you to all who participated! Book 3 in the Omega Sector: Critical Response series, ARMORED ATTRACTION, releases in just a couple of weeks. I’m thrilled about this book because it features Liam Goetz, who has been by far, the most witty, charming and outrageous supporting character of books 1 and 2. 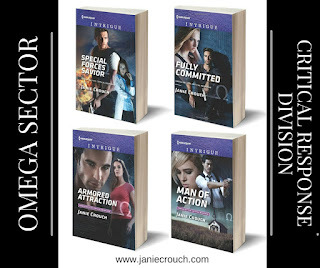 Liam has quite the reputation with the ladies, but no one –even his closest friends and fellow Omega agents— know about the heartbreak in his past concerning Vanessa Epperson. As the story unfolds Liam comes to realize maybe he doesn’t understand everything about his heartbreak either. Liam listened to the voice mail message for the umpteenth time. He could honestly say he’d never expected to hear her voice ever again. After all, she hadn’t even cared enough to leave him a voice mail eight years ago when she’d decided he wasn’t good enough to marry. Or a letter. Or an email. Or a face-to-face explanation. But evidently she’d gotten over her phone aversion. Good for her. Liam played the message again. She needed help and was contacting him because she thought he was still DEA. He hadn’t been DEA for more than five years, since Omega Sector’s Critical Response Division had recruited him to lead their hostage rescue team. Fortunately for Vanessa, since Omega Sector was made up of agents from multiple different law-enforcement agencies—FBI, Interpol, DEA…hell, Liam had worked a mission with a damn Texas Ranger last month—her message had been recorded and immediately forwarded to him. She didn’t mention what sort of trouble she was in, just wanted Liam to drop everything and help her. Like how she’d always wanted everyone to drop everything to do what she wanted. Some things didn’t change. He listened to the message one more time. Liam should call one of his many friends from the head DEA office in Atlanta and have them send someone to Nags Head. Or he might even know someone at the FBI field office in Norfolk he could call. It was the logical thing to do; probably the most professional answer to this situation. He could have someone there handling Vanessa’s problem in three or four hours. But who was Liam kidding? He wasn’t going to make those calls. He was already walking down the hall of the Critical Response Division’s headquarters to his boss’s office. He wasn’t sure what he was going to tell Steve Drackett. Just that he needed some time off to help an old friend. God knew Liam had enough time off saved up. He knocked on Steve’s office door, his back office door that led directly to Steve himself, rather than pass through the main office entrance guarded by Steve’s four assistants. Four young, attractive, quite competent and intelligent female assistants. Liam knew them all; flirted shamelessly with them all. He’d spent so much time in the office with those women that Steve had threatened to fire him several times. Not that Liam dated any of them—he knew better than to date anyone who might have his life in her hands—but at any given moment he’d be leaning on their desks chatting, and keeping them from their work. Liam smiled. Steve’s main office was one of his favorite places in the world to be. But not today. Not right now. He could not go in there and flirt with those beautiful women with Vanessa’s voice still filling his head. 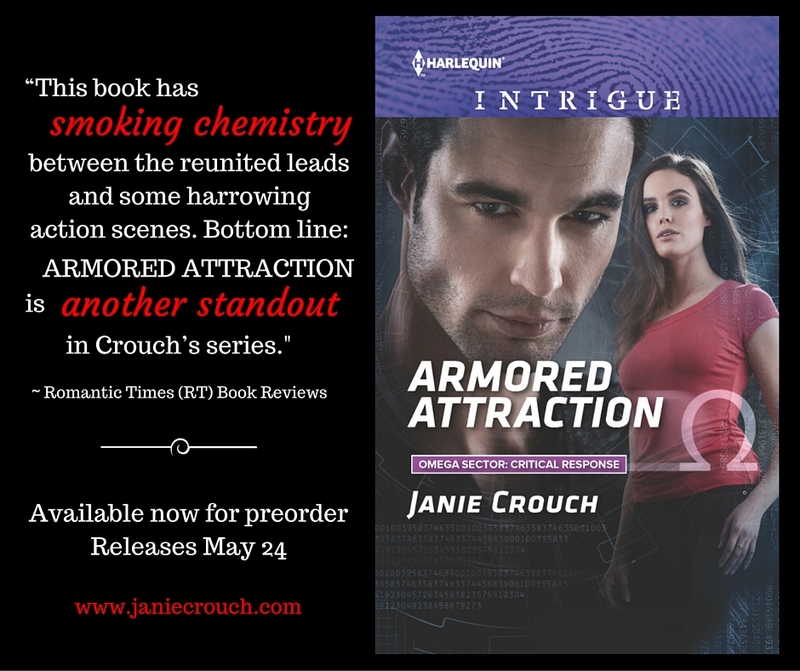 Leave a comment – WHAT ACTOR OR CHARACTER IS YOUR FAVORITE “LADIES MAN”—to be entered for an autographed copy of ARMORED ATTRACTION. 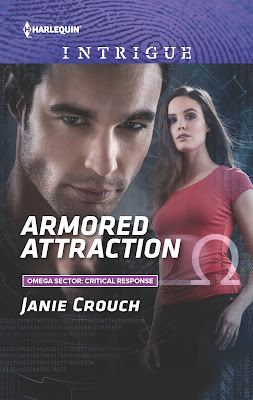 Also, enter in Janie’s other CONTESTS, for a chance to win copies of Books 1 & 2 in the Omega Sector: Critical Response Division, and a fantastic Romantic Suspense Goody Box! I don't know that I do have a favorite ladies man. Nobody? Even from a movie? I loved Neil Caffrey in the show White Collar. :D Thanks for stopping by today. I'm not sure he's exactly a ladies man but I really liked Oscar in Billionaire Bartender: A Second Chance Romance (The Buckeye Series) by Jo Henley. I'll have to check that one out! Thanks for stopping by. LOVE Roarke! Can't go wrong there. :D Great choice! So many great characters out there, but Roarke is a fav of mine too! Definitely an excellent choice! Thanks for stopping by today.